Like all varieties of lettuce, romaine (Lactuca sativa var_. longifolia_) is a cool-season plant. 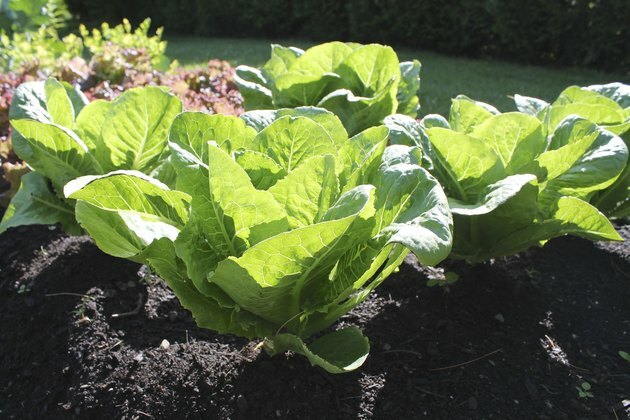 Romaine lettuce is generally ready to harvest at 70 to 75 days after planting. Excited home gardeners don't have to wait that long, however, to sample the fruits of their labor. You can start adding tender romaine leaves to your salads and sandwiches when they are young rather than waiting for the lettuce to reach full maturity. Some even prefer younger leaves to mature ones. Sample the goods; if it tastes "right," romaine is ready to harvest. When your romaine lettuce is about 5 or 6 inches high, it's in the baby-leaf or mini-head stage. At this time, you can start enjoying some of the plant's crisp green leaves while <ahref="https: www.hunker.com="" 12508325="" how-to-cut-lettuce-so-it-keeps-growing"=""> </ahref="https:>letting the plant continue to grow. To do so, harvest leaves on the outside of the plant that are free of rot or wilt, cutting them off about 1 inch from the plant stems. Harvest just a few outer leaves from each plant, allowing the center leaves to continue maturing. Your plants have reached full maturity when the leaves are elongated and overlapping slightly, forming a head that's about 6 to 8 inches high. Usually that will be 70 to 75 days after germination, but different varieties may need a bit more or less time. The 'Paris Island' cultivar, for example, takes a bit longer, while 'Green Towers' is an earlier variety. Harvest the heads when the ribs along the bottom-center of each romaine leaf are fully formed but not overly large or thick. The ribs of romaine turn a milky color if the lettuce is left on the plant too long. A solid rib means the romaine is mature, but milky indicates a tougher. more bitter lettuce. Check your lettuce every day so you don't wait too long to harvest. Using clean pruning tools, cut the head close to the leaf stem, about 1 inch from the soil line. For tender greens, you can also harvest the entire head when it's still immature and in the "baby" stage for tender greens. Because romaine prefers cooler temperatures, around 60°F., you may be able to get a second harvest from the heads you've already harvested. If you cut your whole-head romaine about 1 inch from the soil line, it will start growing more leaves. As you did the first time around, harvest the outer leaves when the plant is about 5 inches tall, and then cut down the entire head when the leaves are 6 to 8 inches high and are slightly overlapping. There are several problems that can make it difficult to get a decent lettuce harvest. One such problem is tip burn. If the tips of the leaves turn brown, simply trim off those edges with your clean scissors and then harvest the rest of the leaves—or leave them to continue growing. This is typically caused by hydration issues, so be sure you're giving your lettuce frequent light watering. Long, hot days may cause your romaine to "bolt" and send out flower shoots. When this happens, cut down the entire plant, leaving 1 inch of stalk, in an effort to grow a second harvest. Also, try adding shade cloth to the area to keep it cooler. Lettuce that is allowed to bolt may taste bitter, so harvest it as soon as you notice any sign of bolting. Wash the lettuce and store it in the refrigerator; after a few days, <ahref="http: extension.illinois.edu="" veggies="" lettuce.cfm"=""> </ahref="http:>the bitter taste may go away. Sometimes, gardeners notice their lettuce turning yellow. This is sometimes the result of a disease carried by aphids and leafhoppers known as the mosaic virus. There is no cure for the mosaic virus. Remove infected plants immediately so the virus doesn't spread. weed frequently, and mulch with aluminum mulch to keep these insects away from your plants. You can also try growing the 'Paris Island' and 'Valmaine' lettuce cultivars, both of which are resistant to the virus.